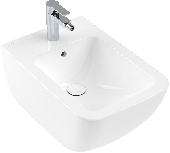 The Venticello product series focuses on product categories: bathroom furniture, washbasins, toiltes and bidets and bring them to perfection. Straight lines paired with fine, elegant ceramics ensure visual weightlessness. 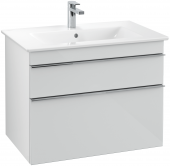 Subtle deepening in the washbasin emphasizes this effect and optimally adapts to the rather straight and only slightly rounded WCs and bidets. 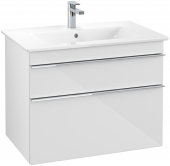 Refined and slim handles on the bathroom furniture give the special touch and set interesting accents.